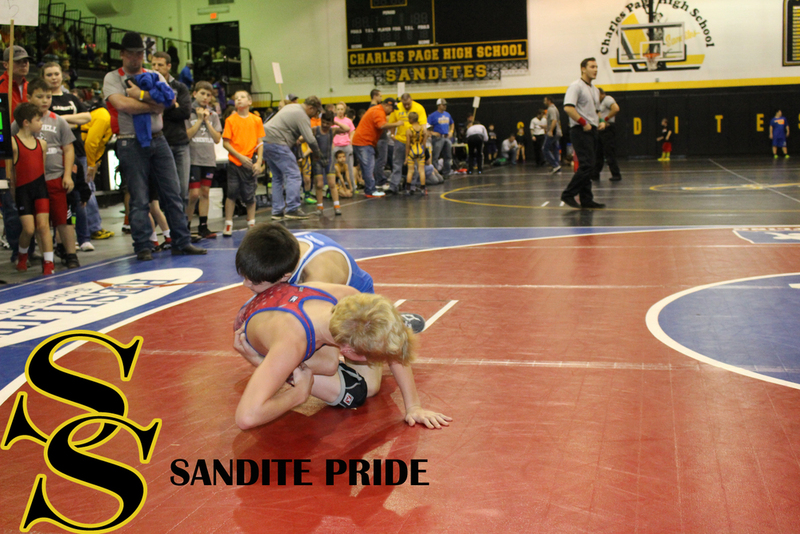 Ed Dubie Field House hosted the Sand Springs Team Big Tournament last month. 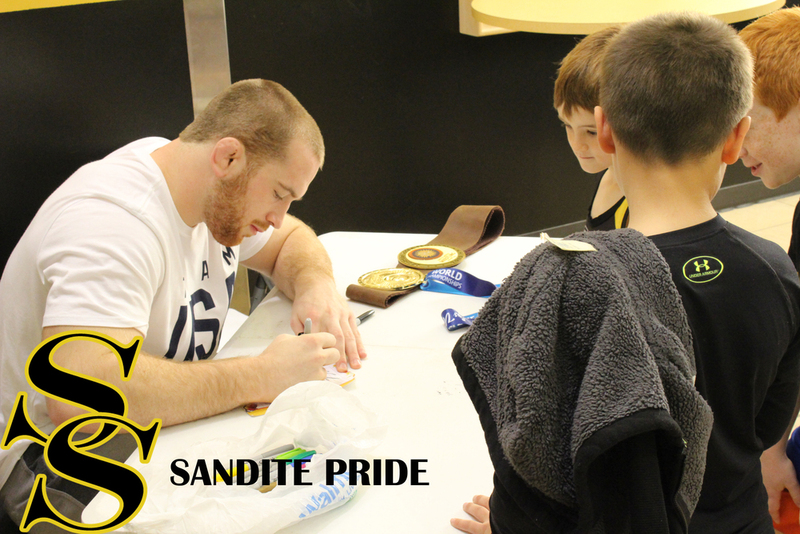 World Champion Kyle Snyder hosted a technique clinic before the tournament and signed autographs throughout the morning. 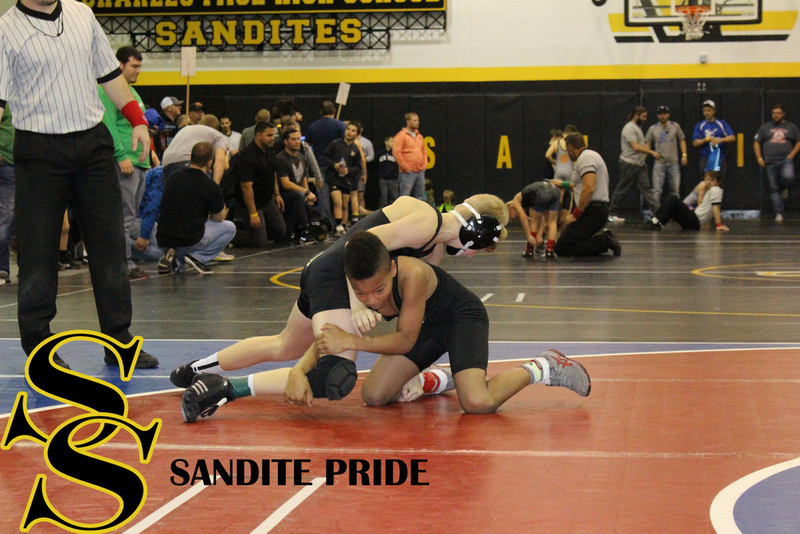 Sand Springs represented well and placed several champions including Kasen McAffrey, Carter Wood, Hunter Spencer, Jaxon Trotter, Clayton Giddens, Carter Young, Blake Jones, Bryce Fisher, Jayden Bussell, Kaden Pope, Colt Cothran, Landyn Barnes, Teric Smith, Blake Stewart, Mason Harris, and Seth Benton. Division 1 40 - Tabor Reiss's place is 2nd and has scored 10.00 team points. Division 1 40 - Blake Stephens's place is 4th and has scored 3.00 team points. 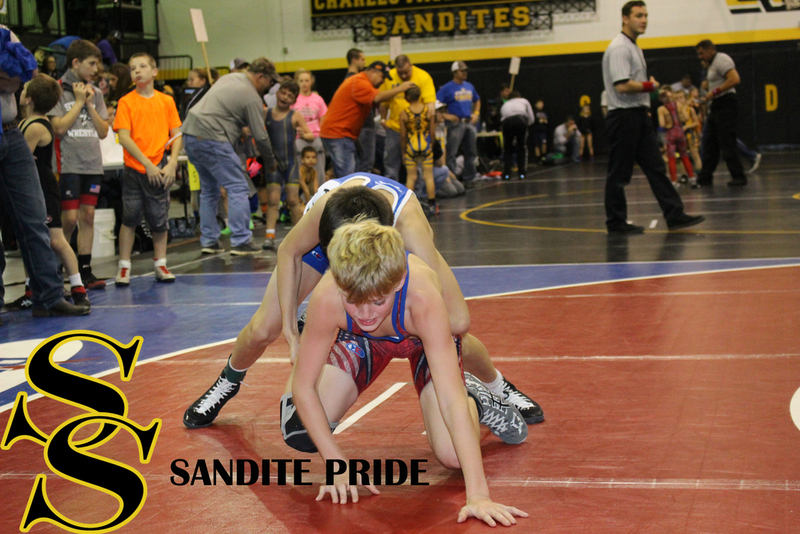 Division 1 46 - Brody Bates failed to place and has scored 2.00 team points. 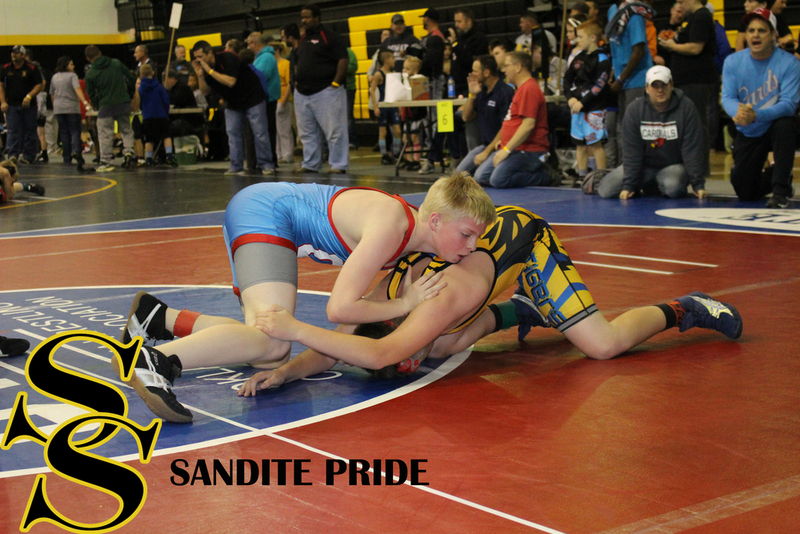 Division 1 49 - Jayden Bussell's place is 2nd and has scored 14.00 team points. Division 1 52 - Kasen McAffrey's place is 1st and has scored 19.50 team points. Division 1 55 - Carter Wood's place is 1st and has scored 13.00 team points. Division 2 (8&U) 46 - Ty Burdge's place is 4th and has scored 8.00 team points. 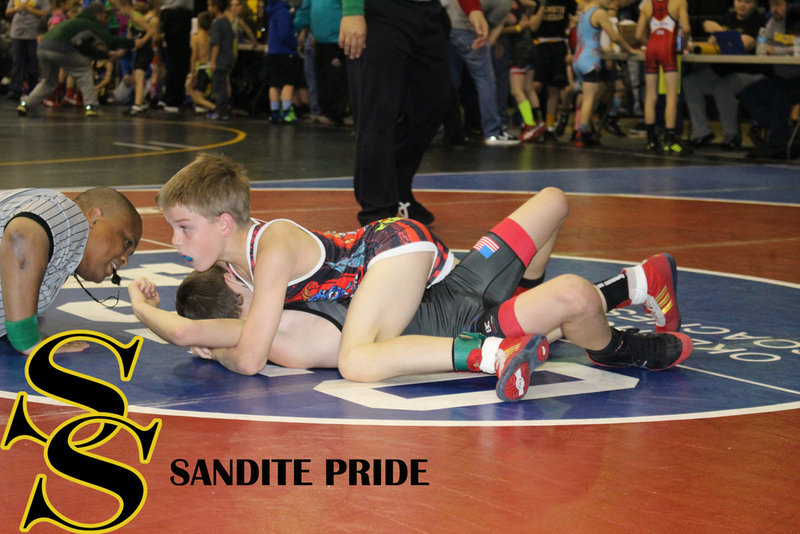 Division 2 (8&U) 46 - Jaxon Grigsby's place is 2nd and has scored 18.00 team points. Division 2 (8&U) 52 - Kasen McAffrey failed to place and has scored 3.00 team points. Division 2 (8&U) 52 - Ayreson Reiss's place is 4th and has scored 9.00 team points. Division 2 (8&U) 55 - Hunter Spencer's place is 1st and has scored 21.50 team points. Division 2 (8&U) 58 - Jace Simms's place is 2nd and has scored 16.00 team points. Division 2 (8&U) 58 - David Ritchey's place is 3rd and has scored 12.50 team points. Division 2 (8&U) 58 - Cayden Colie failed to place and has scored 0.00 team points. 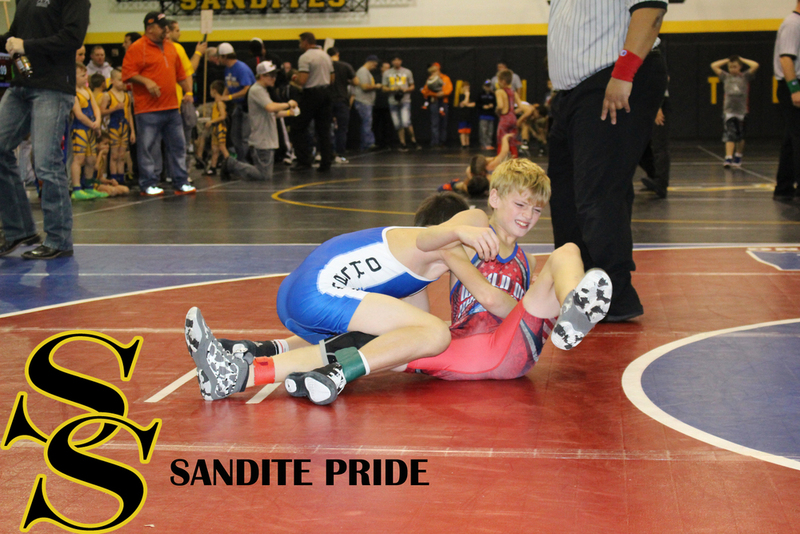 Division 2 (8&U) 61 - Zane Swafford's place is 2nd and has scored 4.00 team points. Division 2 (8&U) 64 - Teric Smith failed to place and has scored 0.00 team points. Division 2 (8&U) 67 - Dallas Flores's place is 4th and has scored 7.00 team points. 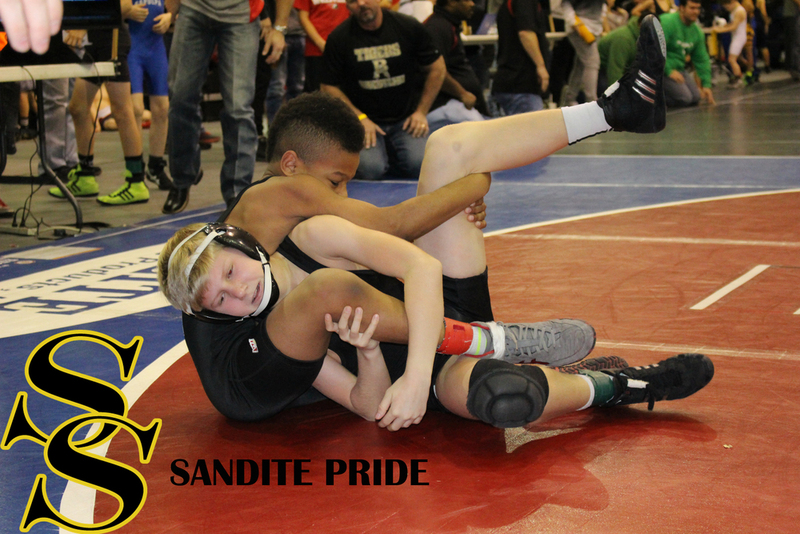 Division 2 (8&U) 83 - Jaxon `Scout` Trotter's place is 1st and has scored 14.00 team points. Division 3 (10&U) 52 - Jackson Martin's place is 2nd and has scored 2.00 team points. 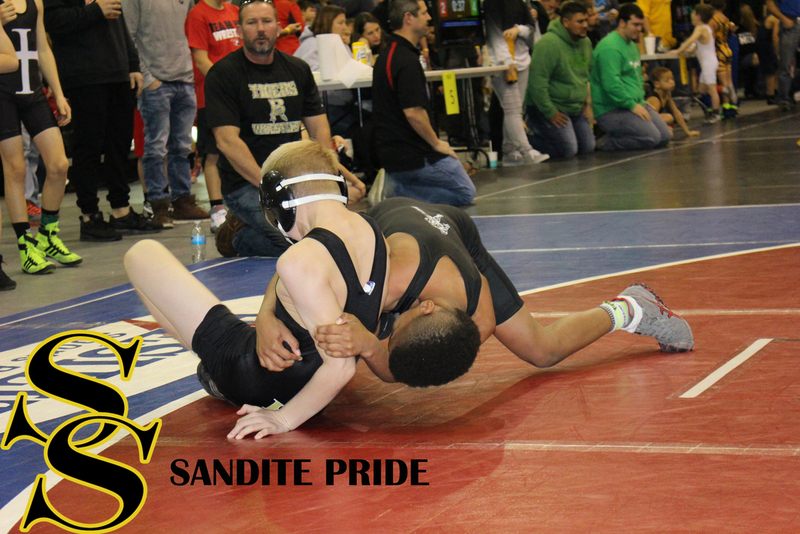 Division 3 (10&U) 55 - Zander Grigsby's place is 2nd and has scored 4.00 team points. 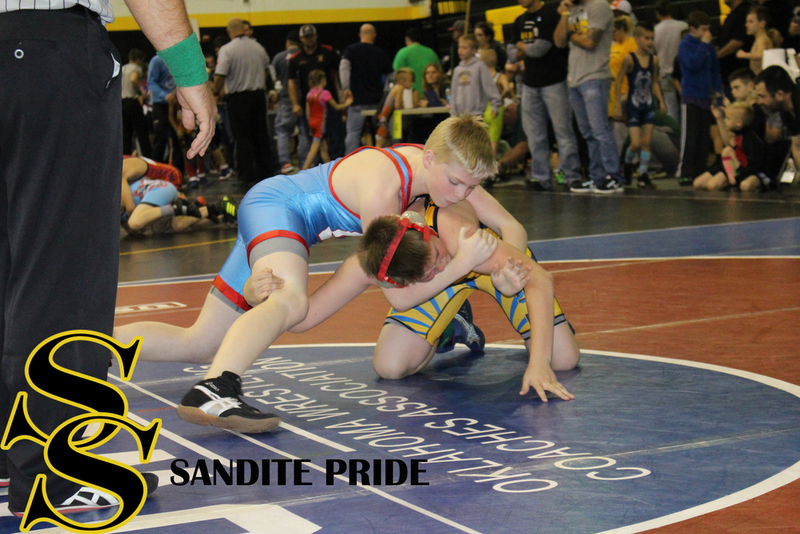 Division 3 (10&U) 64 - Zane Swafford failed to place and has scored 4.00 team points. Division 3 (10&U) 64 - Clayton Giddens's place is 1st and has scored 21.50 team points. Division 3 (10&U) 64 - Mitchell Smith's place is 3rd and has scored 11.00 team points. 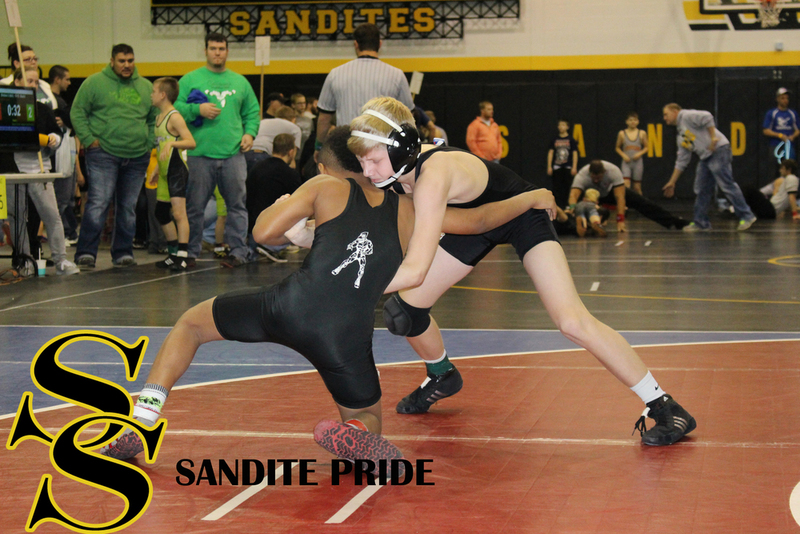 Division 3 (10&U) 80 - Jaxon `Scout` Trotter's place is 4th and has scored 4.00 team points. Division 3 (10&U) 120 - James Winn's place is 2nd and has scored 18.00 team points. 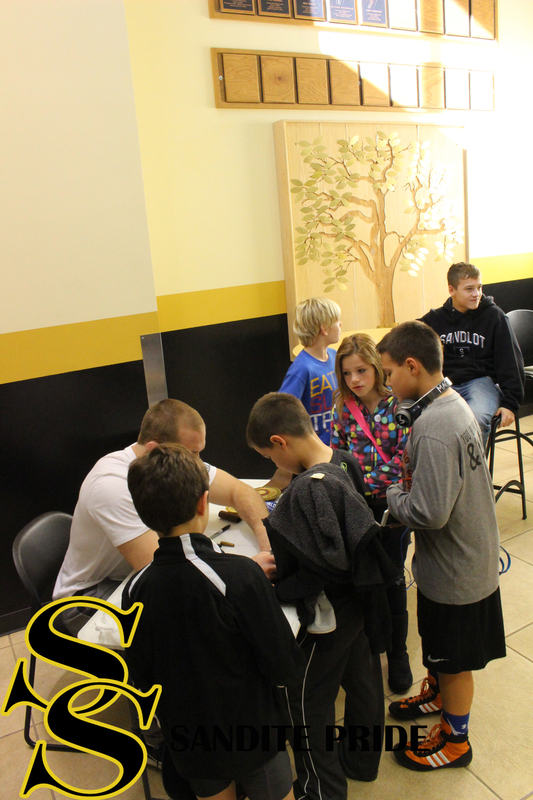 Division 3 (10&U) 285 - Tyler B Smith's place is 2nd and has scored 4.00 team points. Division 4 (12&U) 64 - Owen Martin's place is 2nd and has scored 12.00 team points. Division 4 (12&U) 73-76 - Colton Luker's place is 2nd and has scored 10.00 team points. Division 4 (12&U) 80 - Ethan Norton's place is 3rd and has scored 3.00 team points. Division 4 (12&U) 80 - Sammy Naugle's place is 4th and has scored 1.00 team points. Division 4 (12&U) 80 - Carter Young's place is 1st and has scored 15.50 team points. Division 4 (12&U) 92 - Blake Jones's place is 1st and has scored 22.00 team points. Division 4 (12&U) 100-105 - Chase White's place is 3rd and has scored 9.00 team points. 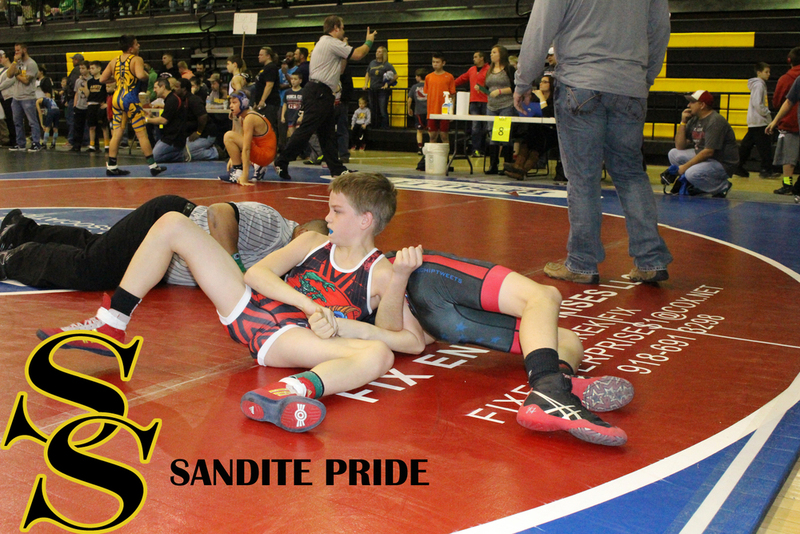 Division 4 (12&U) 160 - Brooks Dudley's place is 2nd and has scored 4.00 team points. Division 4 (12&U) 100-105 - Bryce Fisher's place is 1st and has scored 18.00 team points. Novice 1 (6&U) 37 - Landon Copeland failed to place and has scored 0.00 team points. Novice 1 (6&U) 37 - Asher Giddens's place is 2nd and has scored 16.00 team points. Novice 1 (6&U) 37 - Bentley Cole's place is 4th and has scored 11.00 team points. Novice 1 (6&U) 43 - London Mcginnis failed to place and has scored 4.00 team points. Novice 1 (6&U) 43 - Aaerick Collins failed to place and has scored 4.00 team points. Novice 1 (6&U) 49 - Jareb Boatman failed to place and has scored 3.00 team points. Novice 1 (6&U) 49 - Blayton Collins failed to place and has scored 3.00 team points. Novice 1 (6&U) 49 - Braxton Mcginnis's place is 2nd and has scored 18.50 team points. Novice 1 (6&U) 49 - Jayden Bussell's place is 1st and has scored 28.00 team points. Novice 1 (6&U) 60 - Evan Sartin's place is 4th and has scored 1.00 team points. Novice 1 (6&U) 60 - Carter Wood's place is 2nd and has scored 11.00 team points. Novice 2 (8&U) 43-46 - Jeffrey `Blake` Norton's place is 3rd and has scored 9.00 team points. Novice 2 (8&U) 49 - Kaden Pope's place is 1st and has scored 25.00 team points. Novice 2 (8&U) 49 - Bradie Adams's place is 2nd and has scored 16.00 team points. Novice 2 (8&U) 55 - Tanner Copeland failed to place and has scored 6.00 team points. Novice 2 (8&U) 55 - Trace Atkins failed to place and has scored 0.00 team points. Novice 2 (8&U) 55 - Brody Wilson's place is 4th and has scored 14.00 team points. Novice 2 (8&U) 55 - Colt Cothran's place is 1st and has scored 24.00 team points. Novice 2 (8&U) 58 - Skyler Wood failed to place and has scored 5.00 team points. Novice 2 (8&U) 58 - Nathan Feather failed to place and has scored 0.00 team points. Novice 2 (8&U) 61 - Hunter Jewell's place is 4th and has scored 10.00 team points. Novice 2 (8&U) 61 - Landyn Barnes's place is 1st and has scored 22.50 team points. Novice 2 (8&U) 61 - David Cline failed to place and has scored 0.00 team points. Novice 2 (8&U) 61 - Tyler Smith failed to place and has scored 0.00 team points. Novice 2 (8&U) 64 - Teric Smith's place is 1st and has scored 24.00 team points. Novice 2 (8&U) 70 - Jackson Burdge's place is 2nd and has scored 2.00 team points. Novice 3 (10&U) 55-58 - Joe Pope's place is 4th and has scored 6.00 team points. Novice 3 (10&U) 61-64 - Blake Stewart's place is 1st and has scored 16.00 team points. 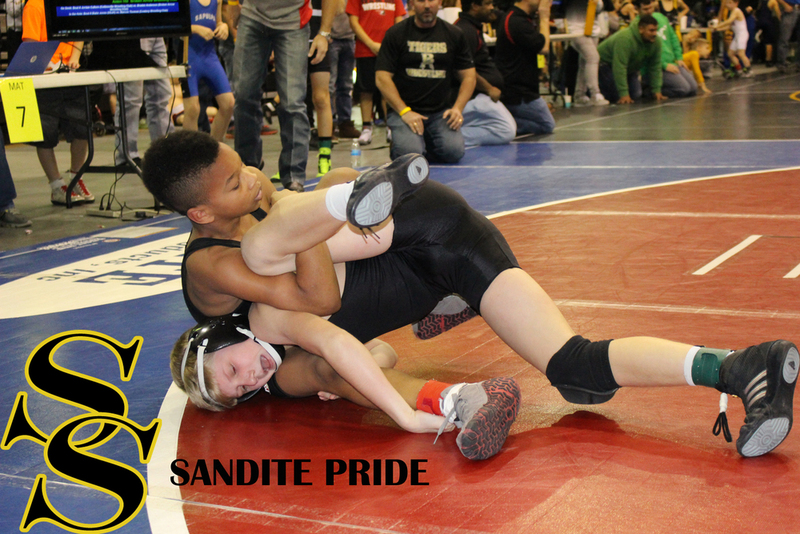 Novice 3 (10&U) 70 - Jonathan Sanchez failed to place and has scored 0.00 team points. Novice 3 (10&U) 80 - Luke McGehee's place is 5th and has scored 0.00 team points. Novice 3 (10&U) 80 - Evan Williams's place is 4th and has scored 1.00 team points. Novice 3 (10&U) 80 - Jacob Lewis's place is 2nd and has scored 12.00 team points. Novice 3 (10&U) 85 - Kayden Campbell's place is 2nd and has scored 14.00 team points. Novice 3 (10&U) 131 - Mason Harris's place is 1st and has scored 9.00 team points. Novice 4 (12&U) 64-70 - Seth Benton's place is 1st and has scored 7.00 team points. Novice 4 (12&U) 80 - Ethan Norton's place is 2nd and has scored 16.00 team points. Novice 4 (12&U) 84 - Ryder Barnes's place is 4th and has scored 4.00 team points. Novice 4 (12&U) 88-92 - Codey Cramer's place is 2nd and has scored 8.00 team points.